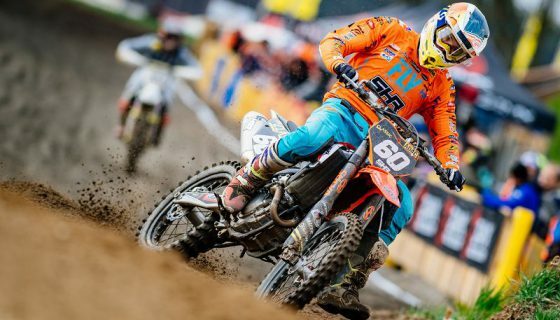 HERLINGS AND JONASS STRIKE FIRST IN RUSSIA. 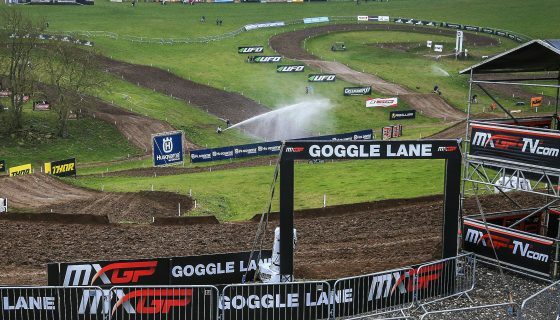 The 2018 MXGP of Russia has seen its first day of racing at the Orlyonok circuit where the beautiful weather matched up with a perfect location for the event, just above the beaches of the Black Sea. Topping the field in the MXGP class was Red Bull KTM Factory Racing’s Jeffrey Herlings and in MX2 it was the #1 Red Bull KTM Factory Racing rider Pauls Jonass. 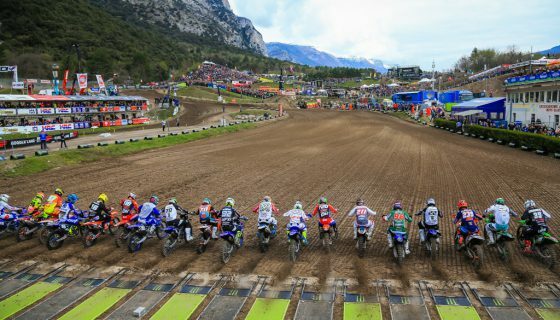 Joining the FIM Motocross World Championship riders was the FIM Europe Motocross Championship classes of EMX250 and EMX300 presented by FMF Racing. The first race of the day and weekend was EMX300 presented by FMF Racing where A1M Husqvarna’s Andero Lusbo held off the charges of both Verde Substance KTM’s Brad Anderson and Vaclav Kovar while in Race 1 of EMX250 Tom Vialle won in dominant fashion over Giuseppe Tropepe and ASTES4-TESAR Yamaha’s Nicholas Lapucci. 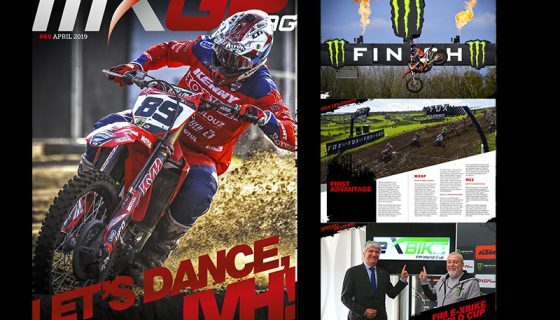 At the drop of the MXGP starting gate Team HRC’s Tim Gajser looked like he would have a great start just behind Red Bull KTM Factory Racing’s Jeffrey Herlings and Monster Energy Yamaha Factory MXGP’s Romain Febvre. Gajser however ended up clipping the back of Herlings which sent the Slovenian to the dirt. Herlings was thrown off by the contact allowing Febvre to take the holeshot. Febvre’s Monster Energy Yamaha Factory MXGP teammate Jeremy Van Horebeek ran second and TM Factory Racing’s Max Nagl ran 3rd before being passed by Herlings and later Monster Energy Kawasaki Racing Team’s Clement Desalle. 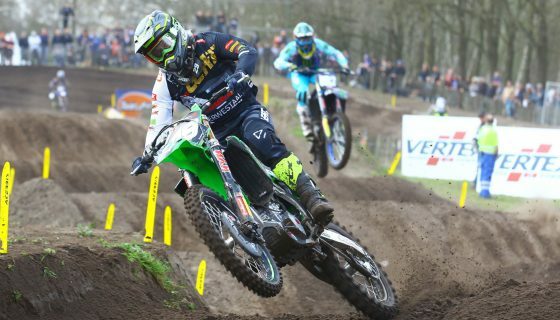 Meanwhile Desalle teammate, Monster Energy Kawasaki Factory Racing’s Julien Lieber was back in 17th. In the next laps Red Bull KTM Factory Racing’s Antonio Cairoli moved into fifth with a move on Nagl. In the second half of the race Nagl battled with Wilvo Yamaha MXGP’s Jeremy Seewer but then both were passed by a charging Julien Lieber. The early leader, Febvre fell twice during the race sending him back to 12th where he would only gain back one position. Back at the front Herlings found his way past Van Horebeek for the lead and Cairoli passed Desalle for third. Cairoli made a mistake in front of Desalle causing the Kawasaki rider to miss his line and allow his teammate, Lieber, into fourth. Only moments later Cairoli lost the front end whilst closing in on Van Horebeek. The mistake allowed Lieber into third while Herlings took the win. Van Horebeek finished second ahead of the career best MXGP qualifying result from Lieber that made impressive passes finishing in third. MX2 Qualifying kicked off with a Holeshot from Red KTM Factory Racing’s Pauls Jonass who was closely followed by the other Red Bull KTM of Jorge Prado. Rockstar Energy Husqvarna Factory Racing’s Thomas Kjer Olsen and Thomas Covington started 3rd and 4th but Covington was quickly moved back by Kemea Yamaha Official MX2 Team’s Jago Geerts, Team HRC’s Calvin Vlaanderen, and the F&H Racing Team Kawasaki’s of Jed Beaton and Adam Sterry. Vlaanderen took over 4th from Geerts early in the race and set his sights on Olsen in third. Not long after Beaton also found his way past the Yamaha of Geerts. Olsen then fell at the end of the roller section and rejoined the race in 10th. 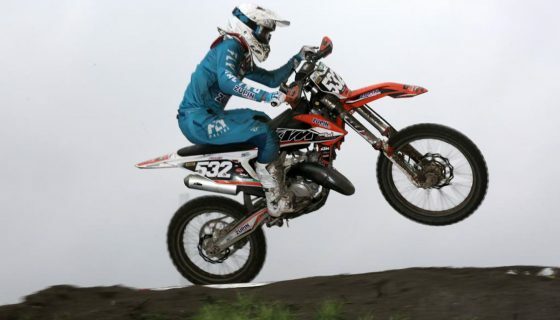 Jed Beaton also crashed and lost positions to many riders including Kemea Yamaha Official MX2’s Vsevolod Brylyakov. Both Olsen and Beaton finished the race in the same position as when the rejoined in 10th and 9th respectively. Brylyakov moved his way into 4th in front of the home fans while Jonass minded his lead ahead of Prado. At the finish line Jonass took the qualifying win 6.5 seconds ahead of Prado with Vlaanderen 3rd. Brylyakov’s 4th was his best qualifying result of the season which positions him well for his first ever home GP tomorrow.